Voice search is picking up steam. You can now use your voice to search the web, play music, navigate home, order sushi or get the latest football results. Not a day goes by without news stories about search assistants like Amazon’s Alexa, Apple’s Siri, Microsoft’s Cortana or Google’s – uh – nameless service. You might think that voice assistants are taking over the world, but that’s not the case – not yet, anyway. In this article, I’ll elaborate on the rise of natural language and voice searches, plus give you tips to prepare your content for these new types of visitors. With voice search, you use your voice to perform actions on the web. In the past, people often laughed at voice assistants because they were slow and had difficulty understanding and answering questions. However, the current generation of assistants is on its way to becoming incredibly sophisticated. Almost every type of query is possible just by uttering it. We’re not there yet, though, to become a real asset to people’s lives, these devices and services have to take it up another notch. Accuracy is often still an issue. But why voice? For one thing, it’s fast; people can speak much more rapidly than they can type. It’s convenient, because you can work hands-free and, most of the time, get instant, relevant results, be it in answer to a question or performing an action. In addition to that, the developments on using your voice as an interface, have resulted in a context-based system that uses many components to give you relevant results. While the significant strides were made on mobile devices, it is now at home were voice operated devices find their place. Amazon has sold millions of Alexa enabled devices, and there’s no end in sight. Recently, Google went on the offensive with Google Home; it’s own smart home assistant. If you look at data from Mary Meeker’s renowned annual trends report, you’ll see that the use of voice assistants is on the rise. 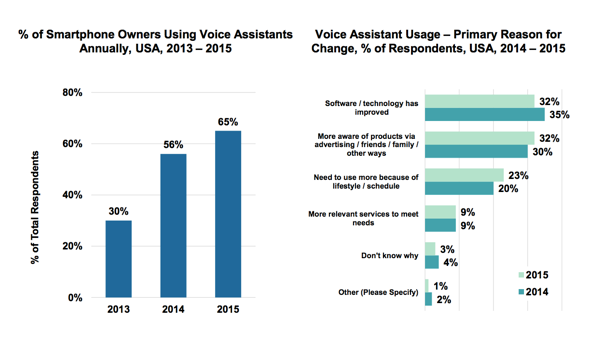 In 2015, 65% of US smartphone owners used a voice assistant, up from 56% in 2014 and 30% in 2013. The main reason for this growth is the improvement of the technology. Meeker also suggests that Google voice queries were up 35 times since 2008 and seven times since 2010. The last one, in May 2016 one in five searches on Android devices in the US is voice activated. 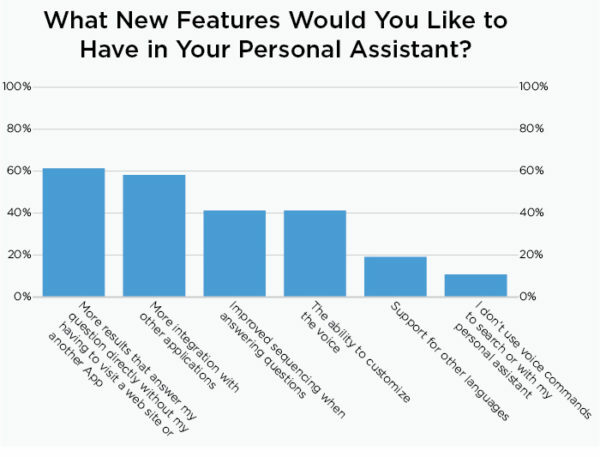 A recent study by Stone Temple Consulting showed that, while people were generally happy with the performance of voice assistants, they’d like them to answer more questions directly. Why and how do people use voice search? It might not come as a surprise that people use voice assistants because they’re convenient, especially when your hands are occupied. They’re a breeze to use, even more so for slow typers. Plus, people love getting fast, relevant results and many just plain enjoy the use of this kind of assistant. However, people rather use these services at home or in the car than on the go and at work. There still seems to be a psychological barrier to belt out search queries in a group of people. Voice assistants use so-called conversational search queries to get an answer to an individual question. These kinds of queries are spoken in a full, natural language sentence, and the reply is in a whole sentence as well. This is something you have to keep in mind when working on your content SEO strategy. If you ask [What’s the weather in Amsterdam today? ], you might get the answer [‘It’s cloudy today, with a slight chance of rain. The maximum temperature is 16C.’] If you’re on a screen-based device, this result might be accompanied by a screen showing you the conditions. Google made answering questions a priority in its Hummingbird update in 2013. This update was meant to change the way Google responds to queries people write or speak. Since Hummingbird, the context of every word in the search query is taken into account. It’s no longer about the words themselves, but what they represent or mean. If you need a reminder of what Hummingbird encompassed, watch Joost explain it all in this video. Hummingbird had a significant impact on how Google scanned your content. It became incredibly important to structure your text properly. Who designed the Golden Gate Bridge? What do I need for a BBQ? When did Sesame Street air for the first time? Where can I get the cheapest pizza in the Bronx? You see that these natural language, conversational searches encompass more words than our typed searches. These are no keywords, but rather key phrases. If you want to rank for these kinds of phrases, you have to have an answer for these questions. Long-tail keywords play an important part in this. More on that in a minute. In the early days, searching with your voice was clunky and error-prone. Many people just gave up in frustration. However, nowadays, voice operated technology is getting smart, fast. Think about it; you can now adjust the spelling of a search query if a result came up with the wrong keyword [night vs. knight]. Searches now take into account what was asked before, so you can ask additional questions to narrow down the results. So, you can ask a voice assistant to find all films by Kevin Spacey. After that, you can bring that down to just the ones he won an Oscar for. Or ones that co-star Morgan Freeman. Context plays a big part in the recent developments of voice assistants. More and more, these assistants look at the world around you to give you relevant results or actions to take. If you’re at home, you might get different options than when you’re commuting to work. Or if you have a particular app running, an assistant might use that information to make an educated guess about what you are doing or what you might want to do. This is only the beginning; we will see a lot more developments on this front. So voice search changes how we search, and therefore we should closely examen the way we provide our content. If you want to answer the natural language questions people use to search for something, your content is the first thing that needs to be fixed. You need to ask yourself what questions your content is answering at this moment and find out if that aligns with the questions people ask. Is the answer all-encompassing or is it incomplete, thus not satisfying the needs of the visitor? You should also think about the readability; is it easy to understand, scannable and instantly comprehensible? Take a long hard look at the conversational queries people use to find what they need. Not only look at your data but also check how your competitors are doing and see how they are trying to answer these questions. Use the autocomplete feature in search engines to see which questions often pop up. Put the answers you find in a spot where search engines can easily filter them out. Don’t make it a long winding answer, but get to the point and serve it straight up. 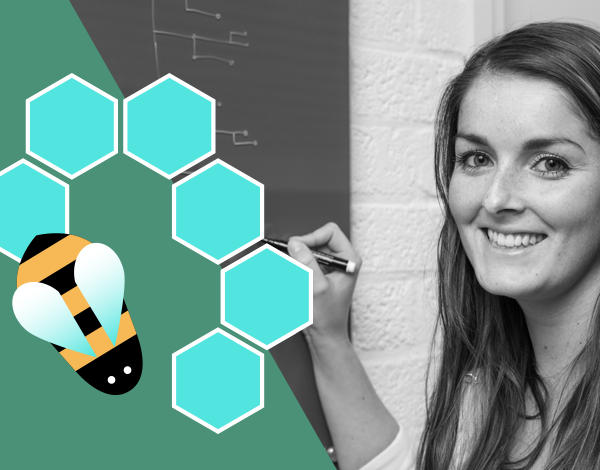 Your content and HTML must join hands to respond to questions in the quickest way possible. Optimize the pieces of content you think are valuable for your visitors, plus the ones you suspect people will search for. To illustrate that, we’ll look at an example from Yoast.com. We are continually working on our content to get it highlighted in Google. That’s no easy task, but keep at it and it will work. 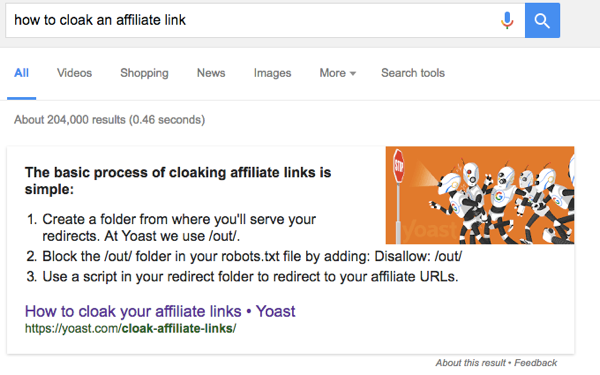 In this case, our article on cloaking affiliate links has been optimized in such a way that it can answer the question: [How to cloak an affiliate link]. Google figures out the question and the answer right from the content. In general, it helps if you use short answers, and present it with bullet points. If you use ten or more steps, Google will add a ‘read more’ link to the answer box, likely getting you a higher CTR. Answering questions in this way, not only gets your content ready for voice search but can also lead to featured snippets in Google, like the one below. To answer natural language questions correctly, you also need to work on your long-tail keywords. Since these spoken questions contain a lot more words than a typed search command [What is the best restaurant near De Dam in Amsterdam] vs. [Restaurant De Dam Amsterdam], you can use these extra words to rank for. It might make it a bit easier to rank higher for the phrases you want to be found for. You’ll also see that searchers will increasingly use terms like [best] or [nearest] to search for relevant results, so that’s something you need to keep in mind. Another good way to answer questions people may have is by adding a FAQ to your site or optimizing the one you already have. Collect the questions people ask and write a short, but relevant answer. Search engines can directly use these answers to give searchers a valid reply to their voice search commands. In addition to offering valuable answers to questions people are asking, your page needs to work flawlessly on mobile devices. Check how it functions on multiple smartphones, tablets, and other gear. Is it perfectly accessible on these devices? Is it attractive, fast and easily readable? It is also a good idea to invest in a proper Schema.org implementation because this gives your pages a lot more context for search engines. For instance, you could add Schema.org markup to your review page, so search engines have a valid source to identify your authority. It sure looks like voice search is here to stay. This brings great opportunities for some, while others might be worried about search engines and digital assistants answering every possible question directly. Should you be worried? Well, that probably depends on your content. If you have high-value content, like recipes, you might be ok. Voice assistants won’t be able to read that recipe for you, yet. If your site offers basic calculation and conversion services, for instance, to calculate the number of teaspoons that fit in a cup, then it’s going to be harder for you to survive in a voice search world. Regular, content-driven sites, need to be able to answer the question voice-driven searchers are looking for. To get your site ready for the slew of voice-activated searches, you need to think carefully about your content; does it answer the questions people have?